Peter Brooksbank reflects on the changing of attitudes and behaviours over the years towards the use of protective gloves. Forty years ago, when I first started out at the steel works complex in North Lincolnshire, we had safety gloves available for manual handling, refuelling mobile plant, using oils and greases as well as using chemicals. The wearing of them was not enforced – well not at the site I worked at anyway. Someone somewhere must have realised the dangers even if they weren’t fully understood and decided to do something about it by supplying gloves. In the main it was the workforce who decided whether to wear them or not and there were various barriers to encourage adoption of safe working practices. There were those who thought it was wimpish or an affront to their masculinity to wear gloves, I kid you not. The attitude of some supervisors and managers was that by supplying gloves they had discharged their responsibility. Then there was the issue of comfort or being able to ‘feel’ what you were touching. Once we had formed a health and safety committee all of these issues were debated and slowly we made progress. Even then the effectiveness regarding any of the safety gloves available to us was not always clear and it was not uncommon for them to fail and still be used until they literally fell apart. As I understand it many smaller companies at that time paid little attention to the use of gloves. I know for a fact that the company I was previously apprenticed to didn’t bother with gloves and we used thinners as well as paint stripper. I knew of men whose fingers were eaten away, their fingernails either badly distorted or in extreme cases missing. What the state of their internal organs was I have no idea. Some were foolish enough to submerge their hands in paint stripper for a dare and see how long they could withstand the burning sensation. Today if anyone was stupid enough to try such a stunt it would probably amount to instant dismissal; in those days the foreman looked on and cheered. Many chemicals used were often of a higher strength or toxicity then, and the long-term dangers of handling oils and grease either unknown, little understood or ignored. Thank goodness times have changed and people’s values have changed through legislation, education and training. One thing that hasn’t changed, however, is that despite all our efforts to instil a positive heath and safety culture in the workplace we are still having accidents. So as ever, it’s important to have the right safety equipment and training for the job, as well as an appropriate safe system of work. The selection, use and storage of safety gloves are no exception. In 2012 the Eurostat statistics for accidents across Europe stated that over 30% were wounds and superficial injuries. It is also estimated that more than 900,000 handling related injuries took place, averaging almost seven days absence from work for each injury. From this it is clear that we are far from where most of us would like to be regarding workplace safety. So what can we do to improve things? Always remember safety gloves are PPE and as such should be used as a last resort. It’s so easy to fall into the mode of “we have always done it this way so pass the PPE.” Although it is highly likely that you will have to use some form of PPE, don’t take it for granted. Explore what’s new in the market place regarding best practices and health and safety equipment. Ensure a competent person carries out a thorough risk assessment of the task or process in question. Get professional help if you feel the competent person is only competent in certain areas. An example of this could be that they have a full understanding of the process and hazards, but lack the latest innovations that could help to reduce the risk. Once the risk assessment is complete you can start to look at your options should the need for safety gloves be identified. Mechanical hazards are coupled with the handling of rough or sharp objects that could roughen, lacerate or penetrate the skin. This could arise when working with metal sheeting, building materials or glass products for instance. Please note that with regards to safety gloves a mechanical hazard is not related to moving machinery. It is extremely dangerous to wear gloves that could get caught in moving parts or serrated blades. Guards should be used when working with serrated blades. Gloves that are sold as protection against mechanical risks come under the European Standard EN388 (2003). This covers the test requirements to ensure safety. The EN388 pictogram indicates how the glove performed when each test was carried out. The scale of 1 (lowest) to 5 (highest) for blade cut resistance and 1 (lowest) to 4 (highest) for abrasion, tear and puncture resistance is shown on the pictogram. For the gloves to be classed as protective gloves they must have a performance level of 1 or above on at least one of the four measures. BS EN 407 – Thermal hazards can be present in many forms. Heat can be radiated and conducted, for instance, or the hazard may be actually flame related. BS EN 511 – The presence of cold can be introduced into a workplace in many ways such as cold stores, water or frozen gases, for example. It is imperative that you understand the type of hazard and temperature range concerned in order to identify suitable protection. Regardless of whether total immersion or merely splash is involved, any substance that would irritate, inflame or burn skin is classed as a chemical hazard. Over a period of time some substances can cause the skin to become sensitive. Other chemicals have a much more immediately damaging and painful effect, like the paint stripper I mentioned earlier. The European standard covering the performance of chemical protective gloves has now been revised and is identified as BS EN 374.2003. In order for a more informed and relevant glove selection to be made, a list of 12 chemicals has been formulated to enable the person purchasing gloves to take a more informed approach. The letters A to L have been nominated and manufacturers have to submit gloves for testing against any three of these chemicals before they can obtain approval. Penetration and permeation of the chemical through the glove is measured to determine the breakthrough time. In order to gain approval as a “Chemical Resistant” glove and meet BS EN 374 2003 ABC , a breakthrough time exceeding 30 minutes has to be achieved. Gloves achieving this can then can carry a revised pictogram together with the identification letters of the three chemicals against which it was tested. Should a glove fail to achieve the 30 minutes breakthrough time it is permissible for it to be classified as a “Low Chemical Resistant” glove. These gloves show a different pictogram and come under BS EN 374 2003 . This pictogram shows no identification letters. Gloves that are approved to BS EN 374.2003 will also carry the pictogram indicating that information is available regarding the glove, instructions for use and any limitations. The pictogram indicates microorganisms can be applied where the glove performs to the level 2 standard regarding the permeation test i.e. in excess of 30 minutes. People who are engaged in fighting fires obviously need hand protection that protects them from heat. In addition to this any safety glove used needs to be able to create a barrier against any liquids or mechanical hazards that may be present in order for them to meet BS EN 659. Where ionising radiation is present in the workplace special protection is needed. In order to protect against ionising radiation any gloves used must contain a certain quantity of lead. The amount used must be marked on the glove. The standard BS EN 421 specifies how the lead content is calculated. Please note: the information above is provided only as guidance, it is intended as an overview and is not exhaustive. You should always check that any gloves purchased are fit for purpose and check that they meet the relevant standard. A system of daily inspections should take place on all PPE before use and safety gloves are no different to any other piece of equipment regarding this. An examination of the gloves should tell you whether they are fit for work or not. It is worth noting the new gloves should be examined before use in order to identify possible manufacturing faults or damage prior to wearing. If it is suspected that there are faults with new gloves they should not be worn and should be returned to the supplier. Any tears or loose threads will render the gloves unusable. Threads can be dangerous around machinery, as they could get caught and pull the hand in. Any holes in gloves that are used when handling chemicals mean that the gloves must be discarded. It is useful to note that they should also enter the correct waste disposal stream for chemicals. The correct cleaning procedure should also be adopted before gloves used with chemicals are taken off, to ensure that none of the chemicals concerned enter or remain inside the glove. Cleaning agents should be avoided as this could lead to a breakdown of any coatings applied. Many years ago when I worked at a training centre we would use chemical-resistant nitrile gloves as liners to ensure any contamination in the glove could not possibly reach the skin when demonstrating the maintenance of batteries relating to mobile plant. We would then dispose of the liner glove each time. The following is a generic toolbox talk regarding the wearing of safety gloves. I always recommend the regular use of toolbox talks within the workplace. Done correctly they help to create a positive health and safety culture. If you delegate tasks or involve the workforce in selection, discussion and training, it reinforces the message, helps you to meet your obligations regarding training and information and maintaining standards, as well as motivation becoming easier. This talk has been formulated to raise awareness regarding the selection of PPE, types of injury and use of safety gloves. It is focused on the need to wear safety gloves when this is indicated in the risk assessment. 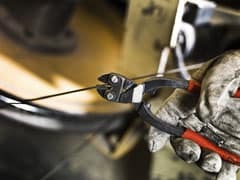 Learning aims This toolbox talk is designed to encourage the correct selection and use of safety gloves, should any work related risk assessment indicate the need for them. It should be noted that additional specific training might be needed in relation to specific gloves for specific tasks. That said, it’s a simple task to adapt it to your needs. Each year thousands of workers suffer workplace injuries that could have been prevented. These include incidences where the injured party could have prevented or reduced the harm done by the wearing of suitable protective gloves when conducting handling activities. Although statistics vary, approximately 30 per cent of workplace accidents involve cuts or lacerations, and 70 per cent are to the hands. There are a variety of glove designs and materials to protect against absorption, abrasions, wounds, dermatitis, penetration, electric shock, and temperature. The type required depends on the operation being carried out. Gloves are available from your supervisor. Check with your supervisor if in doubt about the type you should be using. Barrier creams and hand cleaners are also available and you are strongly recommended to make use of them. All participants should now ask final questions and discuss any points raised during the talk. When complete, the manager is to ensure that all participants have recorded attendance. I have only just scratched the service regarding safety gloves, but I hope I have wetted your appetite to find out more. Remember, if in doubt talk to your supplier, get professional help and ask your workforce. Ultimately, however, the decision rests with you, so choose wisely and help to ensure your workforce stays safe.